Osteoporosis is an all-too-common medical condition that is characterized by fragile, porous bones that are prone to fracture. Also known as brittle bone disease, osteoporosis is most common in women but occurs in men too. While osteoporosis can affect any bone in your body, it is most commonly found in the spine, hips and wrist. This is somewhat ironic because it is exactly these bones you will injure if you take an unexpected fall. It’s no coincidence that osteoporosis is a major contributing factor in the incidence of fractured hips. Sadly, the first time many osteoporosis sufferers are diagnosed is when they suffer a fall and subsequent fracture. Women tend to have smaller, lighter bones than men meaning even a small amount of bone loss can be detrimental to skeletal strength. Female menopause is also a contributing factor in the development of osteoporosis as estrogen is an important factor in bone health and levels drop significantly during this time. Bone is constantly being broken down and remodeled. This process of remodeling and building tends to slow with advancing age. As the years pass, bone remodeling is outpaced by bone breakdown and, as a result, bones become weaker. Bones, like muscles, respond to the stresses placed upon them. Weight-bearing physical exercise results in an increase bone building activity which makes bone denser and stronger. Low levels of physical activity mean less stimulus for bone growth which means any bone loss will be more noticeable. Bones need calcium and vitamin D to develop fully and remain healthy; calcium is a major structural part of bone and vitamin D is required for its transport and utilization. Lack of dietary calcium means that your body will “borrow” calcium from your bones as this mineral is essential for muscular contractions and regulating your heart beat. Consuming adequate dietary calcium, especially abundant in diary and leafy green vegetables such as kale, will help to preserve skeletal calcium reserves. Smoking and excessive alcohol consumption can lead to a premature drop in estrogen levels in women and bring about early onset menopause. 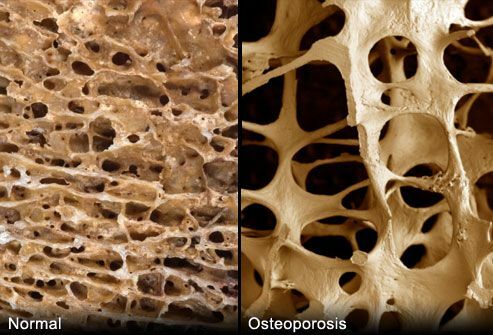 As discussed above, menopause is commonly linked to osteoporosis. Exercise has a very important part to play in the prevention and treatment of osteoporosis. Muscles are attached to bone via tendons and a tough, fibrous tissue called the periosteum. When muscles contract, they pull on the tendons and periosteum which stimulate bone-building cells called osteoblasts. More osteoblast activity means stronger, denser bones. Walking is arguably the most convenient way to keep your heart, lungs and also your bones in great shape. Shoot for the recommended 10,000 steps per day for best results. Increase the bone-building benefits of walking by wearing a weighted back pack and remember, those 10,000 steps do not have to be done all in one go but can be accumulated throughout the day. Weight training, resistance training, strength training – call it what you will but lifting weights is a very effective way to strengthen your bones. If you don’t fancy pumping iron, you can get similar bone-building benefits from body weight exercises such as push-ups and squats and also working out with a resistance band. To get the best results from the least amount of time, build your workouts around standing exercises rather than seated ones and focus on so-called compound exercises rather than isolation. The difference? Compound exercises use multiple muscle groups and multiple joints at the same time where compound exercises involve single joints and fewer muscles. Compound exercises will make your workouts more effective and time efficient. Two or three 30-minutes strength training workouts per week are all you need to keep your muscles and bones in good shape. Getting up and moving more can also have a beneficial effect on your bone strength and density – especially activities that are performed while standing. Gardening, home maintenance, washing your car by hand or playing with your kids can all contribute to the health of your bones because they are all weight-bearing activities. Look for daily opportunities to load your bones and remember that sedentarism is one of the biggest risk factors for developing osteoporosis and should be avoided whenever possible. While osteoporosis affects a large percentage of the population, developing this condition is often avoidable if you stay active and consume a healthy diet. Avoid becoming part of an ever growing group of brittle bone suffers by engaging in regular weight-bearing activity and eating foods that support bone health. Note – this article is intended for entertainment only and is not intended to replace the advice of a medical professional. If you are in any doubt about Osteoporosis or need any further information, please contact your professional health advisor.